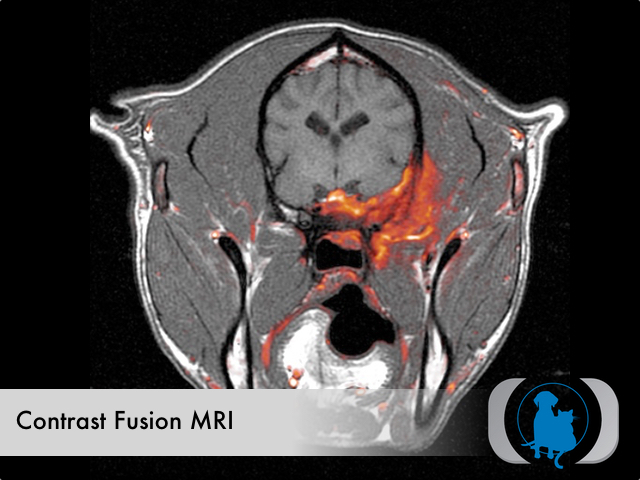 Note the use of contrast fusion MRI imaging that highlights (in color) the area of infiltrative pathology in this 1 year old Female spayed Labrador Retriever dog. 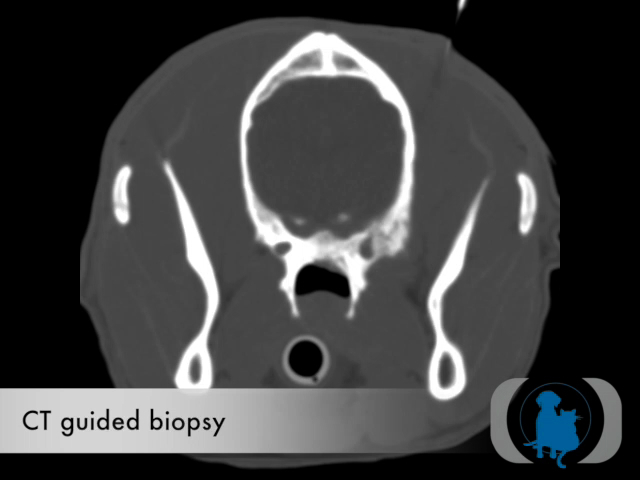 CT guided biopsy of the area identified on cranial MRI allowed confident collection of representative tissue that resulted in a firm diagnosis of cryptococcosis infection. 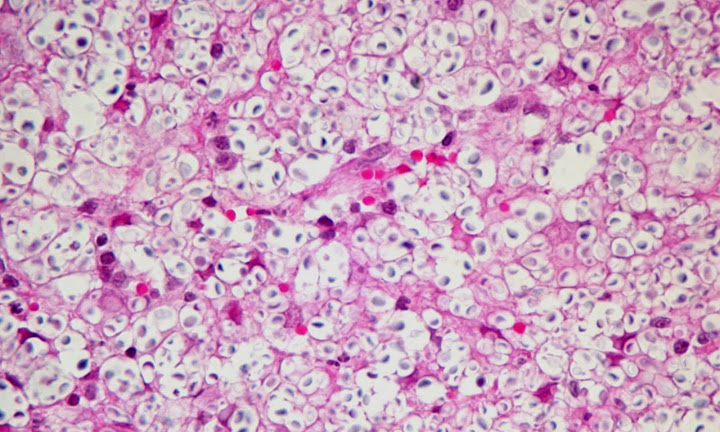 Histopathology revealing the Cryptococcus neoformans organism. Cryptococcus is a ubiquitous soil fungus that more commonly infects cats and less frequently dogs. 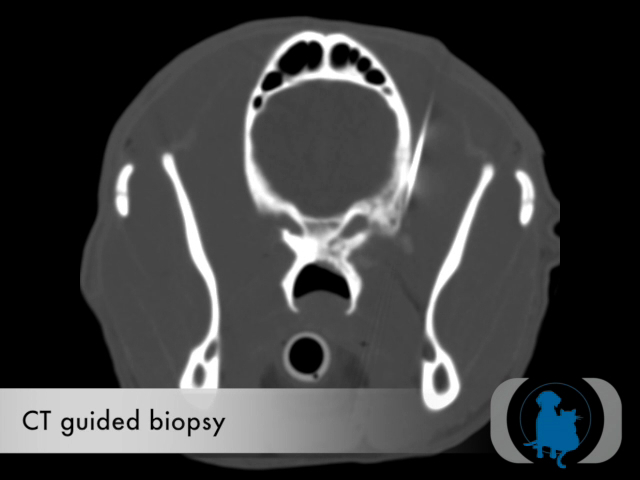 CT guided biopsy of the same dog as the image above allowed a definitive diagnosis of osteosarcoma. The accuracy and safety of imaging-guided percutaneous needle biopsy, aspiration, and drainage procedures have been well documented in the literature. Percutaneous intervention is not only less invasive but much more cost-effective than surgery. Computed tomography (CT) has become the modality of choice for guidance in many interventional procedures in people because of its superior contrast and spatial resolution and its ability to image areas not well demonstrated by ultrasonography such as the lung, retroperitoneum, and bone. CT guided biopsy of abdominal organs is also superior to ultrasound in patients when lesions are obscured by bowel gas. 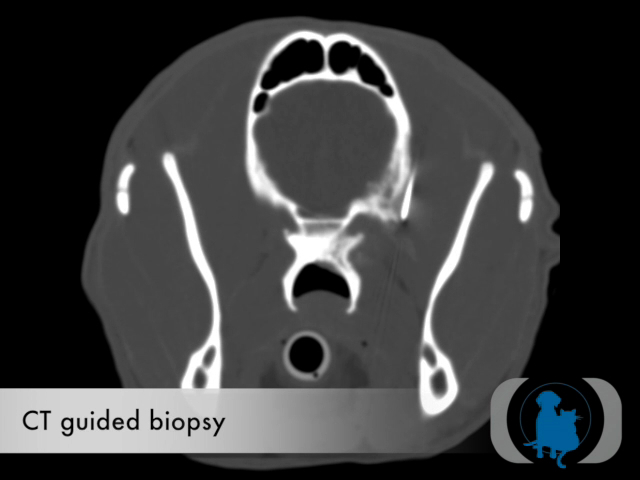 For all of these reasons, the use of CT guided biopsy is rapidly increasing in veterinary medicine as well. 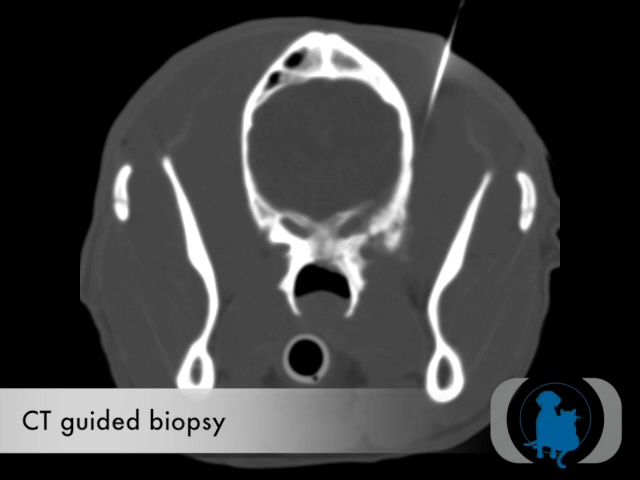 Traditionally CT guided biopsies have utilized a freehand technique that required multiple sequential steps during which image acquisition was separated from needle movement. These technical limitations of traditional CT guided biopsy precluded continuous monitoring of needle insertion. This lack of real-time needle visualization during needle advancement necessitated a very conservative approach to needle positioning, leading to a substantial investment in procedure duration. CT fluoroscopy is a recently developed acquisition mode that allows faster image reconstruction, near-continuous image update, and convenient in-room table control and image viewing during a CT-guided procedure. In a typical CT fluoroscopy system, cross- sectional CT images are updated continually at a rate of several frames per second (12 frames per second at our institution) by using a dedicated high-speed array processor. CT fluoroscopy has many potential advantages over conventional CT guided biopsy. These advantages include the potential for a decrease in patient radiation dose and the potential for increased procedure efficiency and accuracy leading to higher diagnostic yields and reduced procedure time. In veterinary medicine these advantages translate into shorter anesthetic periods and improved safety. For these reasons CT fluoroscopy guided biopsy is replacing traditional CT guided biopsy in people. The limitations to the more generalized use of CT fluoroscopy guided biopsies include the increased investment in more powerful hardware and specialized software needed to implement this computationally advanced procedure. 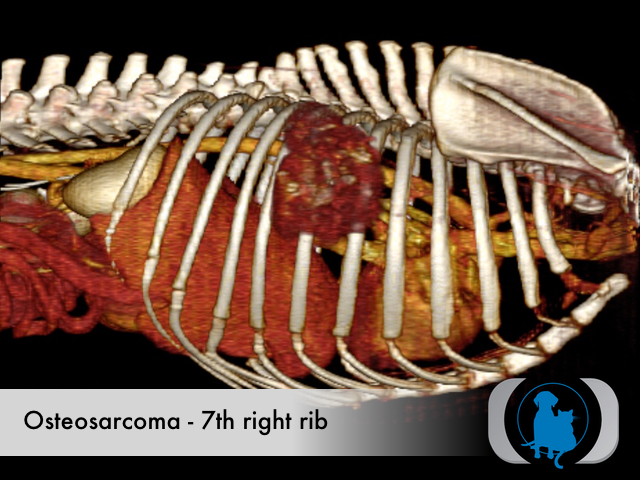 SUREFluoroTM technology provided by AVMI's new Toshiba PRIME 80 slice CT scanner allows real time image guided biopsy of the most hard to reach areas. CT fluoroscopy requires the latest CT technology combined with significant hardware and software upgrades that have limited its availability in veterinary medicine. AVMI's new Toshiba PRIME 80 slice CT scanner with SUREFluoroTM technology will allow us to offer CT fluoroscopy guided biopsies for any of our patients with pathology that is otherwise challenging to access. The technology in this new Toshiba CT scanner allows real-time imaging of needle advancement at 12 frames per second utilizing a 3 slice simultaneous display. The availability of this exciting new technology will allow us to biopsy lesions that previously required much more invasive surgical intervention. 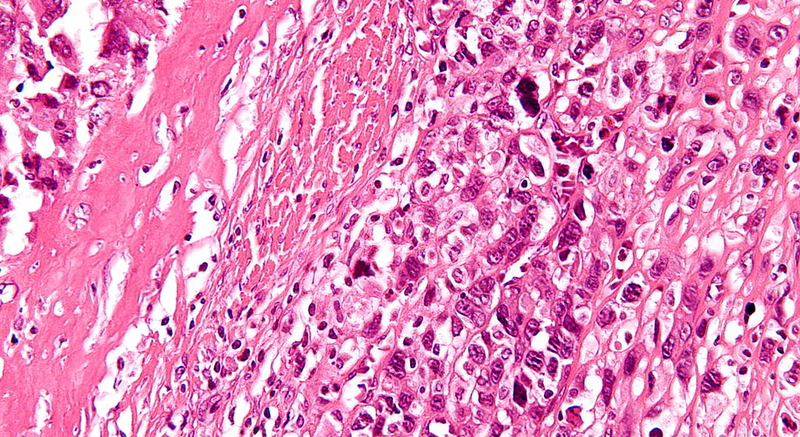 High magnification of a biopsy showing osteosarcoma (malignant cells in the lower right of the image) with osteoid formation. 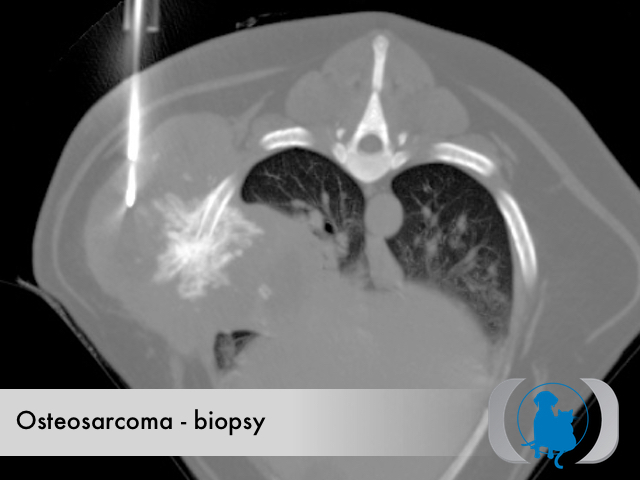 Large pulmonary masses like this pulmonary carcinoma are good candidates for traditional CT guided biopsy. 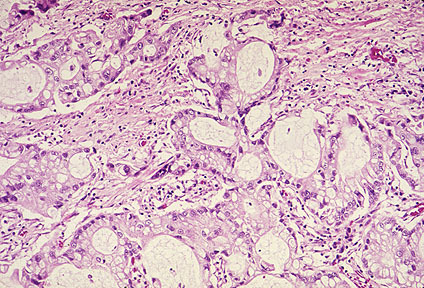 Histopathology of biopsy from mass confirming pulmonary adenocarcinoma.